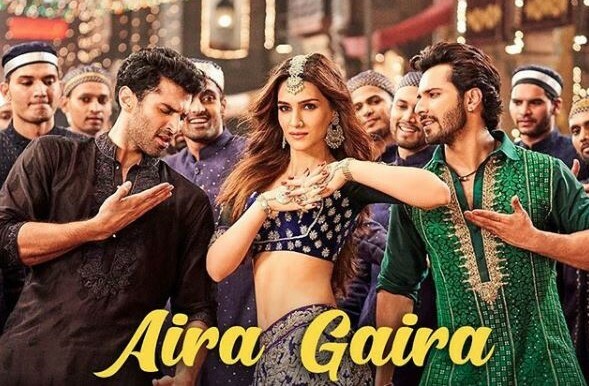 Mumbai: The makers of ‘Kalank’ on Saturday released a new song from the film titled ‘Aira Gaira’ featuring Kriti Sanon, Varun Dhawan, and Aditya Roy Kapoor. Written by Amitabh Bhattacharya, the song has been composed by Pritam. The vocals in the song are that of Antara Mitra, Javed Ali and Tushar Joshi. In just a day, the video of the song has garnered more than 32 lakh views on YouTube. In ‘Aira Gaira’, Kriti looks stunning in an embellished purple lehenga, while Varun Dhawan and Aditya Roy Kapur can be seen dressed in embroidered green and a black Pathani kurta respectively. Directed by Abhishek Verman and produced by Karan Johar’s Dharma Productions, ‘Kalank’ stars Sanjay Dutt, Madhuri Dixit-Nene, Alia Bhatt, Aditya Roy Kapoor, Varun Dhawan and Sonakshi Sinha in lead roles.